Suddenly, on February 2, 2019, Rynold Warren Kahnapace, at age 44, was called home by the Creator. Left behind to lovingly cherish his memory are: his loving mother Ina Kahnapace; brothers Joseph and Justin Kahnapace, Ryan Agecoutay; sisters Constance, Audra (Ron) and Michelle (Kevin Pinacie/ Kaydi, Isisah Hasic) Kahnapace, Rinell Bellegarde. Mother and father– in-law Donna and Bruce Beadle; brothers-in-law Bruce Jr (Tanya), and Brian (Rita) Beadle; sisters-in-law Brittany (Tristan) and Janna (Wayne) Beadle. Uncles Noel (Rose Mae) Kahnapace and Grant Pierce and Warren and Gregory Bellegarde; aunts Gladys Stonechild, Louise Kahnapace and Joan (Wally) Flett, Brenda, Darlene, Tanya, Deidra and Bernice Bellegarde, and Sharon Pierce. Beloved adopted daughter Kianna Beadle and numerous other relatives. Special Friends; Danna Delorme, Morris (Moe) Poitras, Jay Drysdale, Jeff Bird, Jonas Bellegarde, Kevin Pelletier, Raylene Laplant, Larry Butler and many others. 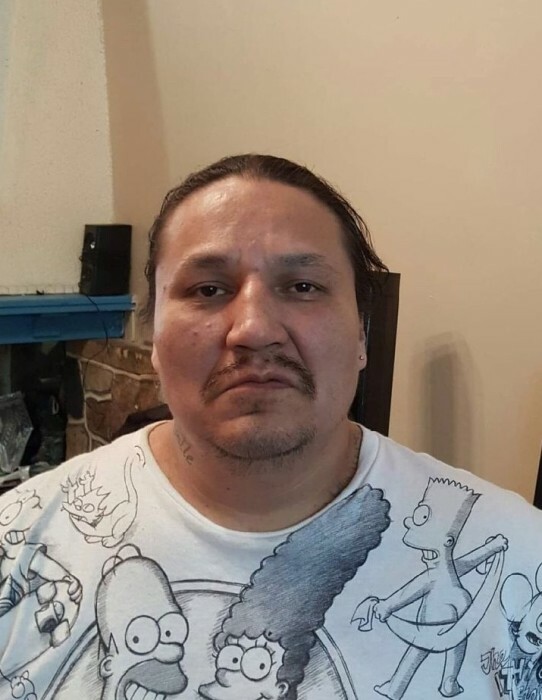 Predeceased by his father Rynold Bellegarde, beloved wife Krystal May Kahnapace (nee Beadle), brother Jay-R Kahnapace and sister-in-law Dawn Beadle and brother-in-law Tyson Tomlin. Grandparents John and Elsie Bellegarde, Henry and Harriet Kahnapace and aunts and uncles, too numerous to mention. A special thanks you to Chief Todd Peigan, councillors and staff of the Pasqua First Nation and the Little Black Bear Chief and Council. Wake will begin on Friday, February 8, 2019 at 4:00 p.m. in the Chief Ben Pasqua Memorial Hall, Pasqua First Nation, SK. Funeral Service will be held on Saturday, February 9, 2019 at 11:00 a.m. in the same location. Interment at Ashams Beach Cemetery, Pasqua First Nation. Dinner to follow. As to families request, no children to attend the wake after 8:00 p.m.
Funeral arrangements entrusted to Conley Funeral Home, Fort Qu’Appelle and Raymore SK, 306-332-0555.